Pickups of the immediate post-war period were intended for work. For today’s Nice Price or Crack Pipe we’ve got a custom five-window Chevy that’s presently working it, but will its price have you clocking out early? You’ve no doubt seen those awesome posts by Tavarish that ask, why buy X dull car when Y cool car is just as cheap? They really get the old grey matter pumping as you ask yourself, yeah, why not? In fact, I’d be stupid NOT to! Of course, the answer to the question is almost always is because the dull car will be a lot cheaper in the long run as it’s most likely newer and built out of less phantasmagorical stuff. An example of that was yesterday’s 2000 BMW 540i which at six-grand could be construed as a like-priced alternative to a slew of what might be considered lesser cars. Point in fact, 70% of you anointed it with a Nice Price win at that amount. Just so we’re all clear though, buying that car could very well be a move akin to Robin Williams deciding to stay with his amnesiac wife in What Dreams May Come. Go look it up, it’s a really apt analogy. Okay, let’s go from a car that many you may really want to a truck that some of you may truly need. 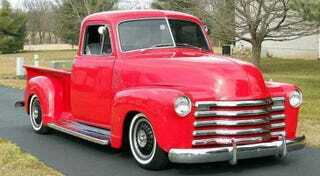 This 1949 Chevrolet 5-window is a show truck, and it sho’ enough does show off. As a matter of fact the ad has a couple of pics of it at… you guessed it, shows. It also has a show board that ticks off its show bonafides. Those include: shaved hood and doors, frenched headlights, poppers for the doors, clean chrome, brilliant paint, Merc tail lights, and a killer stance. Oh yeah, and it has a dual-quad Olds 455 in its bed. Now, when the post-war Chevy pickups where first introduced in 1947, were hailed and denoted as “Advanced Design” owing to their more modern, less bug-eyed comparison to the earlier AKs. One of the most desirable models of those is the Five-window which added two corner lights to the back of the cab. This one is a Five-window, but damn if it isn’t a whole lot more than that. The ad claims independent suspension all around - facilitated by Toronado subframes both front and back - which the truck never had from the factory. Mounted to those are disc brakes and powder coated Toro aluminum wheels. The engine bay - where previously a study six resided - is now a cozy mix of tuck and roll, diamond plate, and grey carpet. The interior is likewise appointed and also features a tilt-telescoping wheel, A/C, and Betty Boop floor matts. I’m not sure where the seats originated, but they look about as comfy as you could want. It’s in bed where things really get interesting though - and isn’t that always the case? Back there you’ll find the massive Olds mill topped with a pair of carbs and a shotgun scoop. There’s also, strangely, a Ferrari badge on the stainless steel bell housing hump, which is awesome in its random inexplicability. As I noted earlier, this is is a show truck, but that doesn’t mean that you can’t show it off by driving it, as it looks perfectly streetable and has power-everything and A/C so it shouldn’t be a slog to do so. Still, this isn’t a commuter, and obviously should never be driven in the rain lest you want to spend your days polishing all the engine chrome and stainless in the bed. Herbert Hoover is supposed to have promised a chicken in every pot and a car in every garage if he was elected president. I don’t know about any chickens, but this would pretty much have to be your second, or third car in your garage, something that’s just for ships and tickles. As you might expect, that extravagance comes at price, and here that price is $39,500. Yes, this is someone else’s project, and yes it has limited applicability to everyday life, but damn if it doesn’t look like a barrel of monkeys. With all that in mind - and not well I could buy X-quantity of Y-cars for that, do you think this Toro-powered truck is worth it’s asking? H/T to Ian who originally found this Fox that led me to this truck.